Yes, it’s quiz time again! I know many of you actually read my posts and perhaps even try to make some changes (if you’re using American grammar), so I hope this little quiz is easy for you! FYI: There may be more than one correct answer in each section. Yes. I know. I am BAD! Amy is a rambunctious 3-year old! Amy is a rambunctious 3-year-old! Amy is a rambunctious 3 year-old! John loves helping others with social media; I am grateful for his help. Frank lives in Denver, Colo., Susan lives in Buzzards Bay, Mass., and Sarah lives in Helena, Mont. Frank lives in Denver, Colo.; Susan lives in Buzzards Bay, Mass. ; and Sarah lives in Helena, Mont. Sarah loves cats, Amy loves dogs, and Fran loves all animals. Interior designer Ann Gilbert will be here at 3 tomorrow. Interior designer, Ann Gilbert, will be here at 3 tomorrow. Our interior designer, Ann Gilbert, will be here at 3 tomorrow. We appreciate your order, we will ship your item out today. We appreciate your order, and we will ship your item out today. We appreciate your order. We will ship your item out today. So, how did you do? 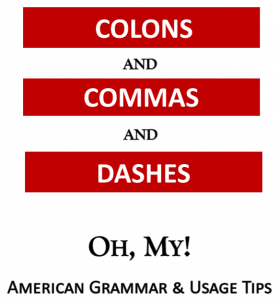 Are you comfortable using these marks in the American grammar system?